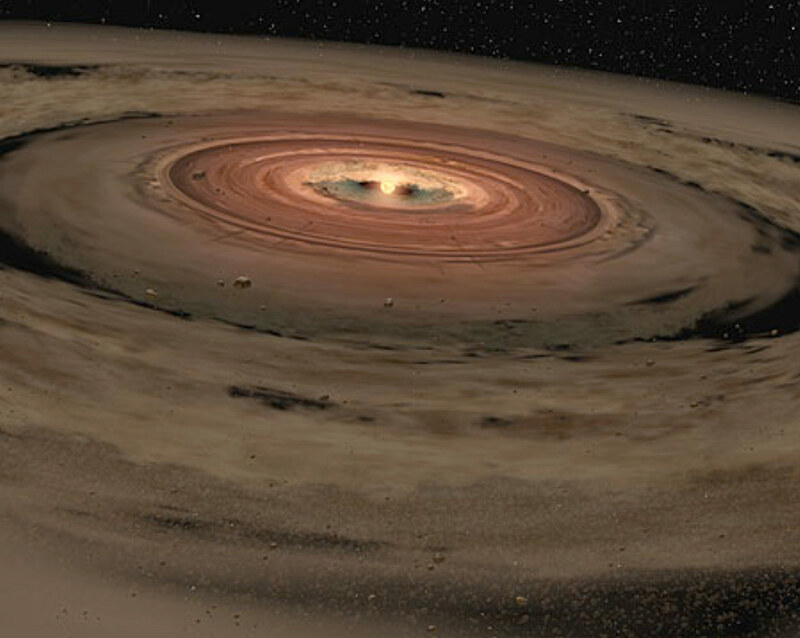 The earliest dust and rocks forming in the solar nebula. Credit: NASA. UC San Diego cosmochemists demonstrated that a chemical reaction, governed by known physical principles, can generate silicate dust with oxygen anomalies that match those found in the oldest rocks in the solar system. 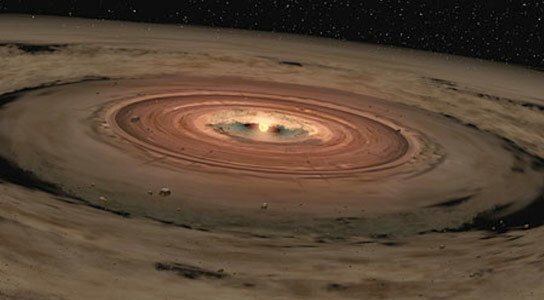 Cosmochemists at the University of California, San Diego, have solved a long standing mystery in the formation of the solar system: Oxygen, the most abundant element in Earth’s crust, follows a strange, anomalous pattern in the oldest, most pristine rocks, one that must result from a different chemical process than the well-understood reactions that form minerals containing oxygen on Earth. Scientists first noted the discrepancy forty years ago in a stony meteorite that exploded over Pueblito de Allende, Mexico, and it has been confirmed in other meteorites as well. These stony meteorites, asteroids that fell to Earth, are some of the oldest objects in the solar system, believed to have formed nearly 4.6 billion years ago with the solar nebula’s first million years. The mix between oxygen-16, the most abundant form with one neutron for each proton, and variants with an extra neutron or two, is strikingly different from that seen in terrestrial rocks from Earth, its moon and Mars. To test that idea, Chakraborty filled a hockey puck sized chamber with pure oxygen, varying amounts of pure hydrogen and a little black nugget of solid silicon monoxide. He used a laser to vaporize a plume of silicon monoxide gas into the mix. These are ingredients seen by radio telescopes in interstellar clouds, the starting point for our solar system. NASA’s Cosmochemistry and Origins of Solar Systems programs funded this work. 1 Comment on "Scientists Recreate Patterns of Oxygen Found in the Oldest Rocks in the Solar System"
Oxygen-18, Oxygen-17 are isotopes that decays to stable Oxygen-16 in course of time, it is generally conceived. The mixture of O-17 and O-18 in the stony asteroids of primordial time of 4.6 billion years ago speaks of different theory. It is the abundance of Hydrogen in the early atmosphere which contributes to the formation of O-17 and O-18 by simple nucleo- synthesis, on account of the powerful gamma radiation in the atmosphere, according to this wonderful article. The textures of the composition of asteroids in its silicon-di-oxide or quartz combinations speaks of their genesis as well. Well! Can we conclude that most of the iron, and silicates were formed in the nebulous atmosphere rather than on the rocky terrestrial planets, thereby ? Thank You.